Suqqu is another reason why my love affair with Japanese makeup has reached fever pitch. I decided to invest in my first Suqqu quad and chose the limited Tsukiakari from the Suqqu Fall /Winter 2012 collection. This palette is a lesson in restraint. Highly pigmented, refined, modern, versatile are the words that come to mind when trying to describe this eyeshadow quad. Let’s let the picture do the talking. Ok, back to business. The Suqqu quad is housed in a sleek black case with Suqqu lasercut into it. Full size mirror for on the go application and 2 mini, double ended applicators – one with sponge tips, the other with brushes. These have varying lengths and shapes for lining and blending. Suqqu brushes are world renown for excellence and these are a little slice of heaven. The top left shade is an iridescent pastel salmon pink. 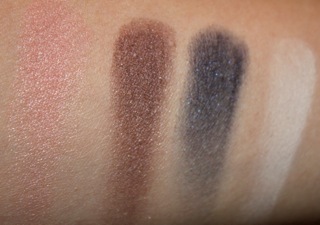 The top right is a deep taupe that can be blended out to be quite soft. These two colours layer beautifully together creating a new mauve-toned shade. 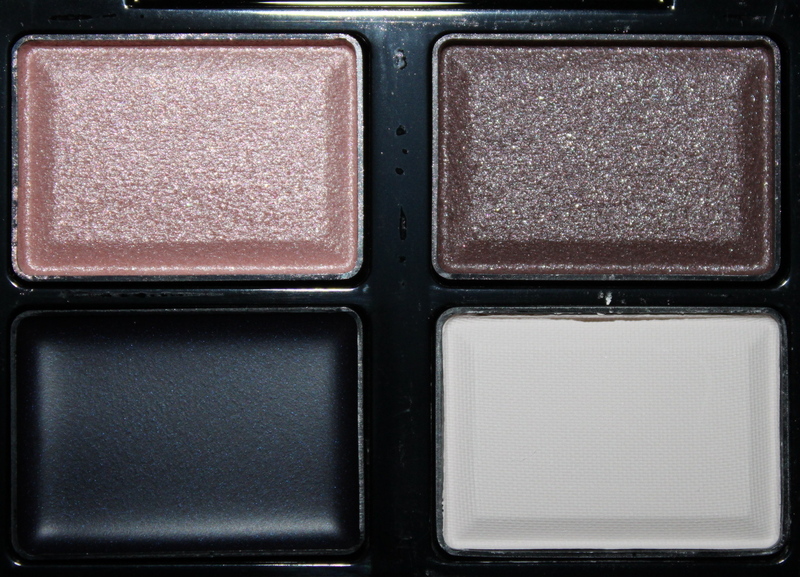 The addition of the cream shadow is new for this palette. The lower bottom left shade is navy with micro glitter in a slightly lighter blue. The bottom right colur is winter white. The white be used on it’s own, just with the navy as a liner. All the shades are buttery in texture and as easy as 1-2-3 to blend. I have done comparison’s of the taupe colour below. You can tell in the swatches that the Suqqu colour is more of a deeper, golden taupe with sparse micro glitter. The Burberry is lighter, matte and has less mauve. Flash back has more of a grey undertone and has the most metallic quality and gorgeous micro glitter. RBR is most similar to Rosewood but with more iridescence. Suqqu Blend Colour eyeshades are silicone and amino-acid coated. These ingrediants are meant to increase wear time and help keep your lids healthy. The Suqqu ethos is to enhance you eye and bring out their natural beauty. This quad does this and more. 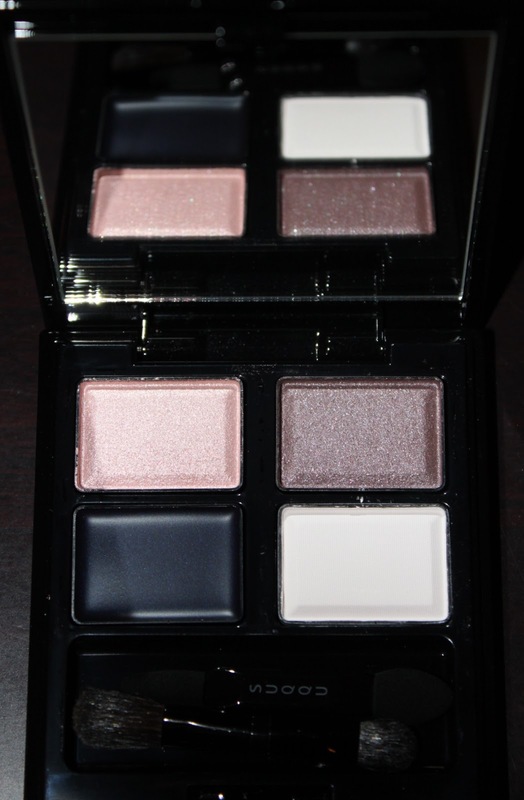 The navy cream shadow gives this particular suqqu palette a moody edginess. The Navy cream shadow can be used to line your eye or as an all over base to create a super cool lived- in look with the other shades blended over it. I did a daytime winged eyeshadow look, with the navy on the outer corners winged out slightly. The taupe I pressed into the outer corners as well and pulled it back into the centre of the lid. The pink I patted over the centre on the lid and then blended. You can then go back over the navy with a soft touch to add a bit of intensity. I dragged the navy softly under the lower lashline to bring it all together. Suqqu looked great by the end of the day and I detected no fading. I bought my suqqu quad from Ichibanko.com. The lovely Kelly was very helpful and the shipping was super fast (I added expedited shipping). You do pay more for the palette, but since many high-end brands where I live have hyped up prices, I felt relatively comfortable doing so. Suqqu is sold through limited vendors throughout the world, and only hope that it becomes more accessible. This is a deluxe, beautifully made product and will be in heavy rotation through the coming months. Now onto pick out my next Suqqu quad…………. Which Suqqu quad is your favourite?